As German Chancellor Angela Merkel receives a European medal honoring her achievements in the “freedom from fear” while tackling Europe’s worst migrant crisis since WWII, RT looks back at other controversial awards given out to international leaders. 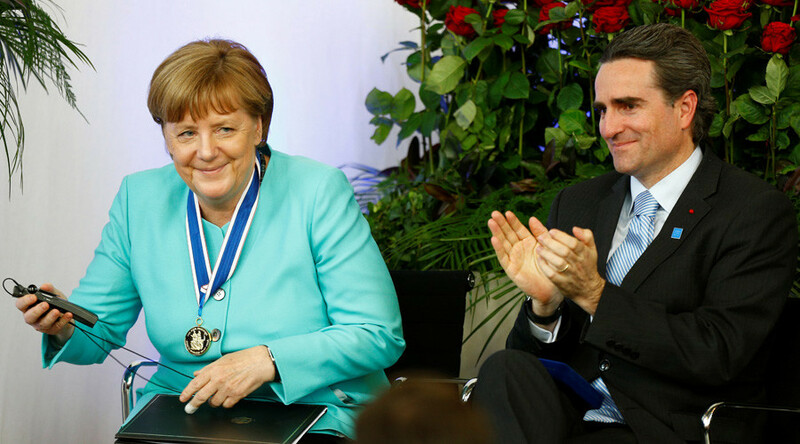 Merkel received the International Four Freedoms Medal from the Netherlands-based Roosevelt Foundation on Thursday. The German Chancellor was honored for her "great moral leadership," promoting the "four freedoms" famously articulated by then US President Franklin Roosevelt in 1941: freedom of speech, freedom of worship, freedom from want and freedom from fear. Opening borders to large numbers of refugees has arguably been the most momentous decision during Merkel’s 10 years in office, which sparked controversy and tension between Berlin and Germany’s federal states. Critics also questioned Merkel’s merits where freedom of speech was involved, reminding of her decision to allow the prosecution of a German comedian who wrote a crude poem about Turkish President Erdogan. 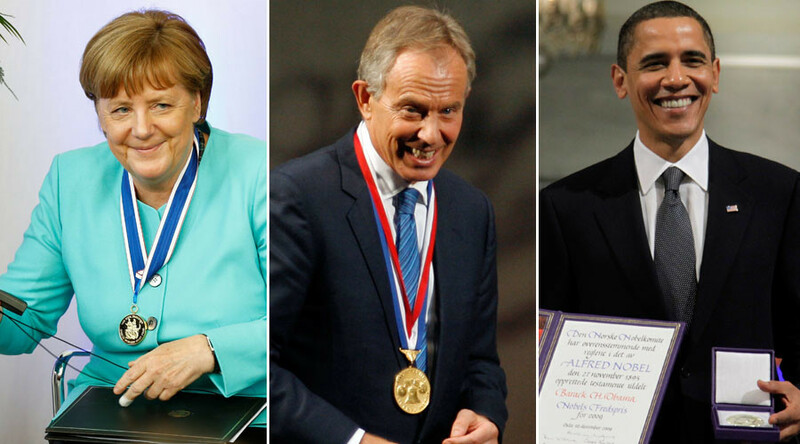 Former British Prime Minister Tony Blair has collected a clutch of international awards honoring his "global legacy" in dealing with the world's problems. Despite being responsible for involving Britain into the 2003 Iraq war, which among other problems caused the deaths of thousands of civilian children, in 2014 the US arm of Save the Children recognized Blair for his role in "making poverty history." The "Global Legacy Award" caused widespread criticism, with hundreds of Save the Children staff signing an internal protest letter calling the decision "morally reprehensible" and "inappropriate." Over 100,000 more signed an online petition, urging the award to be revoked. 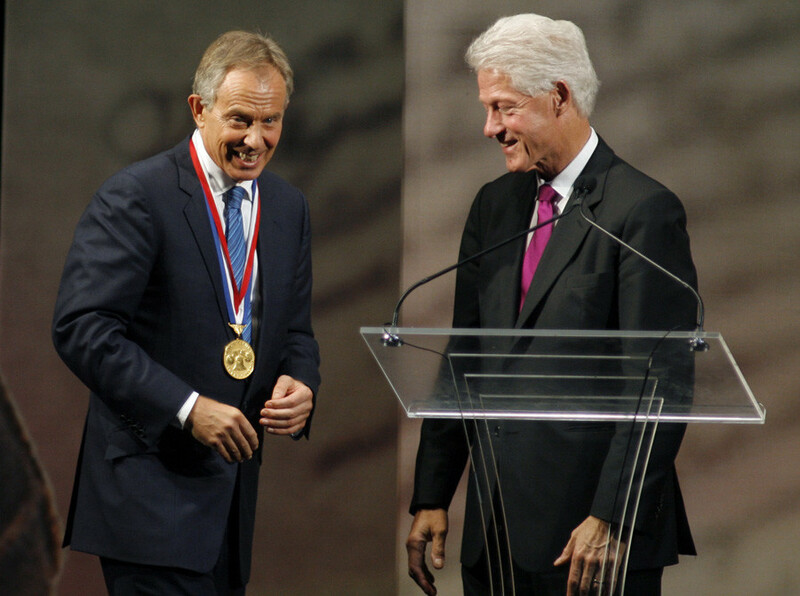 Blair also received another US award from the hands of former US President Bill Clinton in 2010. He got the Liberty Medal, awarded to honor men and women of courage and conviction who strive to secure the blessings of liberty to people around the globe. The US Secretary of State under presidents Richard Nixon and Gerald Ford, Henry Kissinger was among the most disputable award-winners ever. 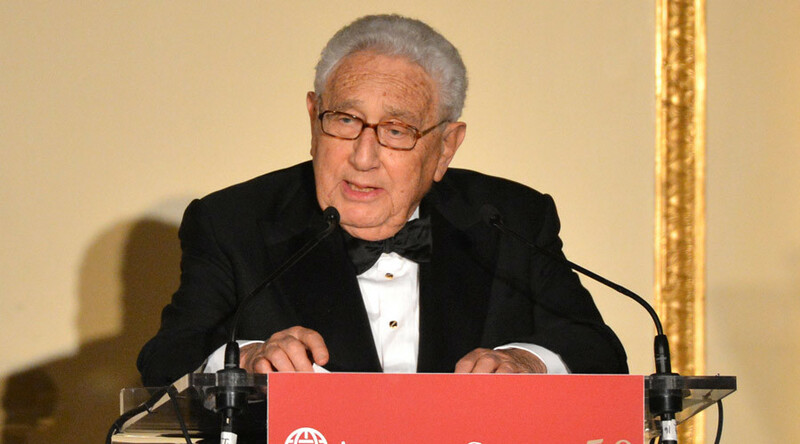 Kissinger received the Nobel Peace Prize in 1973, despite his alleged involvement in a campaign of political repression in Latin America, known as Operation Condor, the US’s active support for the Pinochet coup in Chile in 1972, as well as US bombing campaigns in Cambodia. The choice of the Nobel Prize winner was widely mocked, with critics saying the award has "made political satire obsolete." 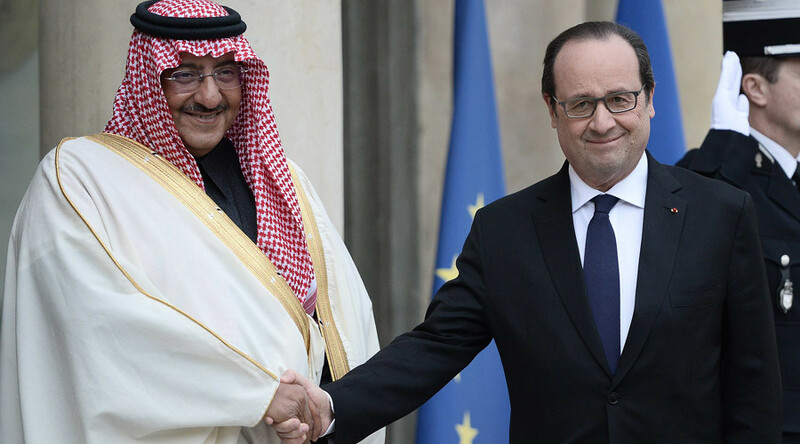 French President François Hollande came under fire from human rights groups after he awarded Mohammed bin Nayef, Saudi Arabia’s interior minister, with the Order of Légion d’Honneur, France’s highest civil honor, for “efforts in the fight against terrorism and extremism” last month. The decoration sparked ire among activists who slammed the Gulf state’s abysmal human rights track record and the prince’s personal complicity in the common Saudi practice of mass executions as interior minister. “As Saudi human rights activists, we have documented several instances where terrorism laws have been used against various sectors of peaceful civil society, including lawyers, protestors, activists and some even prosecuted for tweets,” wrote Ali Adubisi, director of the European Saudi Organization for Human Rights (ESOHR), while criticizing Holland’s choice of a prestigious honor recipient. “We believe the value of such an award has been undermined and that the human rights records of individuals must be considered... for receiving such an award,” he added. The human rights advocate pointed out that on the same day the ceremony held, Shia Muslim opposition activist Makki al-Orayedh was reportedly tortured to death in detention some 390 km from Saudi Arabia’s capital Riyadh with officials insisting that he died of “deep-seated fear,” Press TV reported. In September 2015, the UN revealed a no-less-surprising decision to appoint Faisal bin Hassan Trad, the Saudi ambassador to the UN, a chair of the key human rights panel of the UN Human Rights Council despite open criticism from reputed human rights groups such as UN Watch. In 2014, Bahrain’s National Institution for Human Rights and Ombudsman for the Interior Ministry were chosen by the EU as recipients of Chaillot Prize for the Promotion of Human Rights in the Arab Gulf region. The prize was said to have marked the “remarkable efforts and work for the promotion and protection of human rights.” At the same time, Bahrain has been repeatedly accused by various human rights organization brutally torturing political prisoners, including with electric shocks and sexual abuse. These “practices violate Bahrain’s obligations as a state party to the United Nations Convention against Torture and Other Cruel, Inhuman or Degrading Treatment or Punishment and other international treaties, and contravene the prohibition of torture in Bahrain’s constitution and its penal code,” Human Rights Watch reported in 2015. 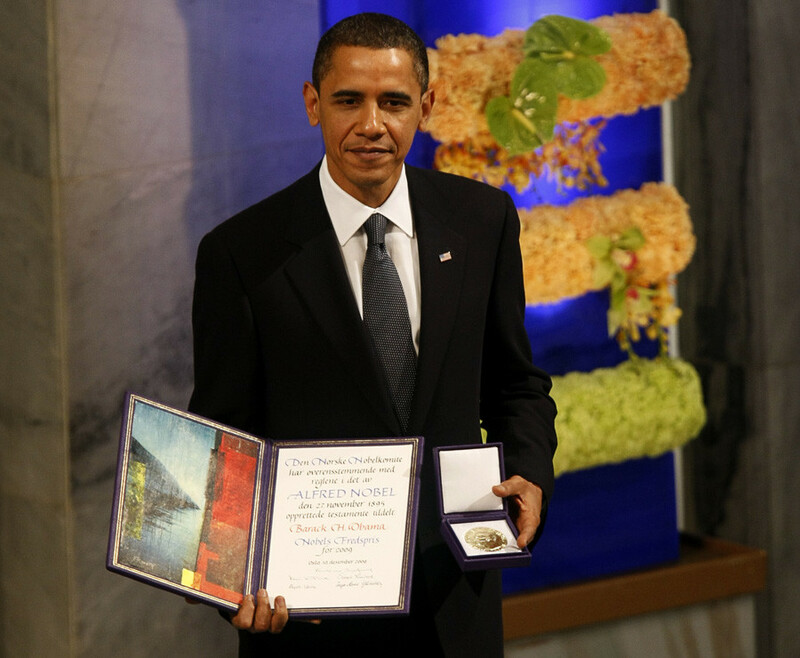 The controversial Nobel Committee decision to bestow a peace award on US President Barack Obama in 2009 has even faced a formal investigation into the selection process after a subsequent public outcry and repeated complaints from prominent Norwegian peace researcher Fredrik Heffermehl. “Do you see Obama as a promoter of abolishing the military as a tool of international affairs?” the scholar told AP in 2012, accusing the committee members of bias. If there were any dim hopes that Obama, freshly sworn into the office, would immediately put an end to the US military campaign in Afghanistan, they were too optimistic from the start. A week before delivering a speech accepting the Nobel Prize, Obama announced the US would send extra 33,000 troops to the country. Further events proved that Obama is indeed an unlikely candidate to be awarded for promoting peace and international security. In 2011, he ordered military strikes on Libya following enforcement of a “no-fly zone” by the UN Resolution No 1973. The ensuing military campaign resulted in Muammar Gaddafi’s brutal assassination and the country’s descending into the chaos of civil war. Meanwhile in Afghanistan, the departure of the remaining US contingent has been put off in the wake of a resurgence by the Taliban. In 2014, Obama almost ventured into a new military invasion as tensions around the Syrian crisis soared. The diplomatic maneuvering from Moscow, which offered a solution by persuading President Bashar Assad to abandon his chemical weapons stockpile, might have saved the US citizens from another costly war. The US still got stuck in Iraq and Syria, leading a bombing campaign against Islamic State, and arming and training anti-Assad rebels, despite utter failures in the latter. In contrast to the controversy over Obama’s award, the Peace Prize has been won by much-celebrated winners, including US civil rights campaigner Martin Luther King, Jr (1964); Soviet human rights and anti-nuclear activist Andrei Sakharov (1975); Missionary and anti-poverty campaigner Mother Theresa (1979); imprisoned Myanmar politician Aung San Suu Kyi (1991); and Nelson Mandela, the first ANC president of post-apartheid South Africa (1993). 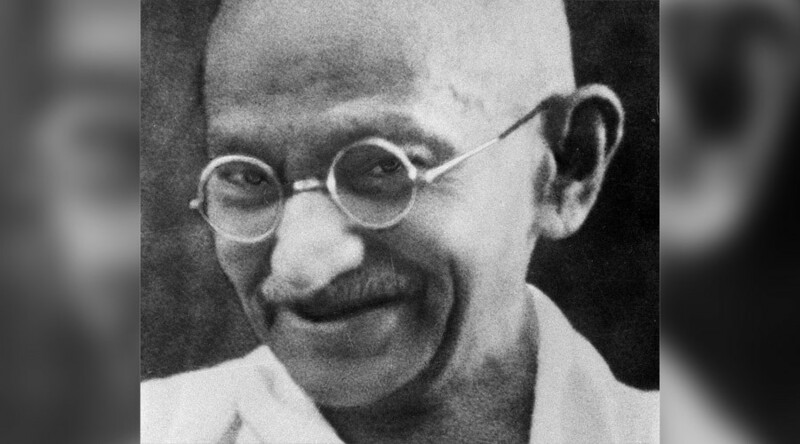 Mahatma Gandhi, the campaigner for Indian independence and pioneer of non-violent struggle, was nominated several times for the Nobel Peace Prize, but never received it. In 1948, a year after his assassination, the Nobel Committee decided not to award the Peace Prize, declaring that "there was no suitable living candidate." The Peace Prize cannot be awarded posthumously.